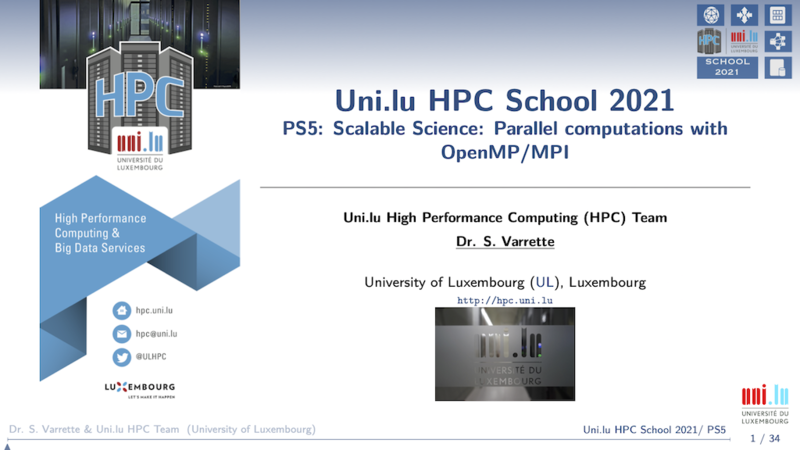 The objective of this tutorial is to show you how to run your MPI and/or OpenMP applications on top of the UL HPC platform. open another terminal (or another screen window) as you'll want to monitor the execution. OpenMP (Open Multi-Processing) is a popular parallel programming model for multi-threaded applications. More precisely, it is an Application Programming Interface (API) that supports multi-platform shared memory multiprocessing programming in C, C++, and Fortran on most platforms, instruction set architectures and operating systems. OpenMP is designed for multi-processor/core, shared memory machine (nowadays NUMA). OpenMP programs accomplish parallelism exclusively through the use of threads. A thread of execution is the smallest unit of processing that can be scheduled by an operating system. Typically, the number of threads match the number of machine processors/cores. However, the actual use of threads is up to the application. the presence of the num_threads clause overrides both other values. Use -c <N> (or --cpus-per-task <N>) to set the number of OpenMP threads you wish to use. (again) The number of threads should not exceed the number of cores on a compute node. Thus a minimal Slurm launcher would typically look like that -- see also our default Slurm launchers. You have to setup the reservation to match the required number of OpenMP threads with the number of cores within the same node i.e. You can find in src/hello_openmp.c the traditional OpenMP "Helloworld" example. Check the set variable $OMP_NUM_THREADS. Which value do you expect? Execute the generated binaries multiple times. What do you notice? Prepare a launcher script (use your favorite editor) to execute this application in batch mode. Note: if you are lazy (or late), you can use the provided launcher script runs/launcher.OpenMP.sh. Check the elapsed time: what do you notice ? One way to test most of OpenMP feature is to evaluate its execution against a benchmark. For instance, we are going to test OpenMP installation against DataRaceBench, a benchmark suite designed to systematically and quantitatively evaluate the effectiveness of data race detection tools. It includes a set of microbenchmarks with and without data races. Parallelism is represented by OpenMP directives. Open another terminal (or another screen window) to monitor the execution (see intructions on top). --small    : compile and test all benchmarks using small parameters with Helgrind, ThreadSanitizer, Archer, Intel inspector. The Message Passing Interface (MPI) Standard is a message passing library standard based on the consensus of the MPI Forum. The goal of the Message Passing Interface is to establish a portable, efficient, and flexible standard for message passing that will be widely used for writing message passing programs. MPI is not an IEEE or ISO standard, but has in fact, become the "industry standard" for writing message passing programs on HPC platforms. In the MPI programming model, a computation comprises one or more processes that communicate by calling library routines to send and receive messages to other processes. In most MPI implementations, a fixed set of processes is created at program initialization, and one process is created per processor. Of course, it is possible to have hybrid code, mixing MPI and OpenMP primitives. you can also use -n <N> to specify the total number of MPI processes you want, but the above approach is advised. pmi2 is currently available, we'll switch to PMIx with the incoming RESIF release introducing the 2018a toolchains. Thus a minimal launcher would typically look like that -- see also our default Slurm launchers. In the above example, 2x28 = 56 MPI processes will be launched. You can find in src/hello_mpi.c the traditional MPI "Helloworld" example. Note: if you are lazy (or late), you can use the provided launcher script runs/launcher.MPI.sh. Of course, you can have hybrid code mixing MPI and OpenMP primitives. You can find in src/hello_hybrid.c the traditional OpenMP+MPI "Helloworld" example. the -xhost option permits to enable processor-specific optimization. you might wish to consider Interprocedural Optimization (IPO) approach, an automatic, multi-step process that allows the compiler to analyze your code to determine where you can benefit from specific optimizations. you are trying to use mpirun (instead of srun) from Intel MPI within a SLURM session and receive such error on mpirun: make sure $I_MPI_PMI_LIBRARY is not set (`unset I_MPI_PMI_LIBRARY``).